While attending the HP Analyst Summit in Boston, MA, at the beginning of March, I had several déjà vu moments that brought together the past, present, and future. 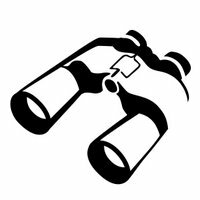 As I researched the event for an upcoming Observations post (stay tuned for April’s), I encountered some general sources that included some industry-specific mentions that I thought I would share. Twenty-five years ago, an article from the LA Times Magazine predicted what the year 2013 would hold. A University of Southern California professor, Jerry Lockenhour, recently tasked his class with assessing just what in the article did come true and what didn’t. An article on the professor’s process is described in an LA Times piece by Bob Pool, and a follow-up story, “2013, as Imagined by Futurists in 1988,” by Zak Stone, which appears on Fast Company’s co.existhttp://www.fastcoexist.com/ Web site, goes into some of the details of the class’s findings, including some related to printing. I recommend both stories for further reading, but the printing parts are especially worthy of highlighting here because they are related to the print-on-demand story I am writing about HP’s Analyst Summit. In his article, Stone mentions two categories that the original article got “right,” including “Smart Houses” and “GPS and the computerization of cars.” As a recent buyer (and now fan) of the “Nest” smart thermostat, I have to agree with Stone’s comments about the automated home category. Also, cars clearly have become more computerized, with self-driving vehicles predicted for the near future. In the “wrong” category are two items, one of which brings to mind the Jetson’s “Rosey the Robot,” i.e., “Ubiquitous robo-servants and robo-pets.” I took special notice of the other one, “home-printed newspapers.” Stone describes how “the article also predicts that each morning the [fictional Morrow family’s] laser-jet printer would automatically print off a feed of news stories most interesting to them.” But the wrong part, Stone continues, is that “while the way people read the news has certainly gotten more personal, the most common medium of delivery would be the smartphone, not the printer.” This is something that many of us are thinking about and discussing these days. Stone offers an alternative, and wraps up by saying, “this tiny printer that prints you a tiny newspaper might mean this is coming.” He also includes a link to a Fast Company story on the Berg Little Printer, a favorite of Observations (see “Lessons from the Little Printer That Went Viral”). Readers following my advice to read both the LA Times and Fast Company articles will appreciate a little of the ambiguity on display in my summary above. Determination of a black-or-white, true-or-untrue conclusion over whether specific predictions have come to pass isn’t necessarily as easy as it might seem. We’ll see more evidence of this in my next column. I entered the professional world decades ago with an undergraduate degree in quantitative methods. My first “real job” was in sales forecasting back in the late 1970s. Of course, statistical methods used in forecasting are based on modeling historical trends and patterns and then applying them to the future. A bit later, I earned by MBA in marketing and econometrics, and I re-entered the work force in the high-tech industry. I fell back into sales forecasting roles with a newly found interest in going beyond the numbers to identify what was most likely to happen in the future based on qualitative elements as well. Having played the role—at least a small one—of a “futurist” during much of my career, I was also interested in an article that recently appeared on the Business Insider Web site. In “Everyone Is A Futurist Now,” guest writer Scott Smith of Quartz makes some great points, but I was most interested in his discussion of Ray Kurzweil (whom I wrote about in my October Observations) and of 3D printing, which he includes as a futurist topic du jour along with “drones, algorithms gone wild, augmented reality, and smart cities.” As his article’s title suggests, Smith’s main assertion is that we all own the future and insights into what it will hold. There is plenty of material out there about the future—what we thought it would be and are now living, and what really will follow in the next years and decades. It is fascinating stuff, especially for those of us in the printing and imaging industry. Over the weekend, I posted my first take on the news about HP and Samsung announcing a mobile print solution for the newly announced Galaxy S4 smartphone. (See “News - HPand Samsung Launch New Mobile Print Offering”). In that post I reported the news headline and provided the link to the details of the story via press release, but also offered a little discussion of the concept of “coopetition”, when two companies battle in some markets, and work together in others. My long-time experience as an HP employee gave me a birds-eye view of one of the classics, HP and Canon, and tech news lately has been dominated by another, Apple and Samsung, though the competitive piece of that one has been drowning out the cooperative aspect, even up to and including the Thursday evening Samsung launch of their new iPhone competitor, the aforementioned Android-based Galaxy S4. 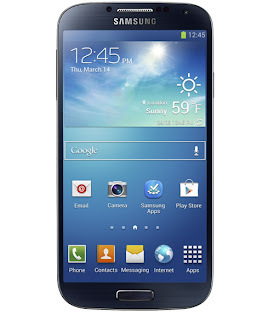 (For example, see “Apple in extraordinary attack on Samsung's Androidoperating system ahead of Galaxy S4 launch”). But HP, still more promise than delivery when it comes to being a player in the mobile space (smartphones and tablets), remains the undisputed leader in the printing and imaging category, so it is nice to see their “hitching their wagon” to another industry leader, in another category. And this is not the first time, as they have led they way in supporting Apple’s AirPrint and Google CloudPrint. I gained some additional insight into the urge to at least keep even with an all-HP solution, just about 10 days ago. During HP’s Analyst Summit in Boston in early March, many of the assembled group of analysts were curious to see and hear from the management of combined PC and imaging and printing groups, now PPS for Printing and Personal Systems group. Many who have followed HP for a long time, or have other close ties to them, appreciated the Imaging and Printing Group’s (IPG's) independence. So the combining of the groups a year ago was dreaded by some, especially since the PC group as recently as August 2011 was intended to be spun out or sold off. And with long-time printer chief Vyomesh Joshi retiring, and the new group headed by Todd Bradley, the former PC-only boss, looked to be a potential downgrade from the old IPG. So seeing the team come together made for a much-anticipated panel discussion. One of the stories told about the first gathering of the group last spring was the consensus determination to make HP mobile devices print to HP printers as easily or better than the user experience with Apple’s mobile devices doing the same. The teams came together to make it happen (though it wasn't exactly a new idea - the HP TouchPad from 2011 included an improved printing experience, which wasn't enough to save it from the scrap heap.) So HP tablets can tout an industry-leading printing solution once again, but it comes as no surprise that the company also figured out how to associate with smartphone maker Samsung as part of its Galaxy S4 announcement last Thursday. Duly noted - HP and Samsung have launched a new mobile print offering. 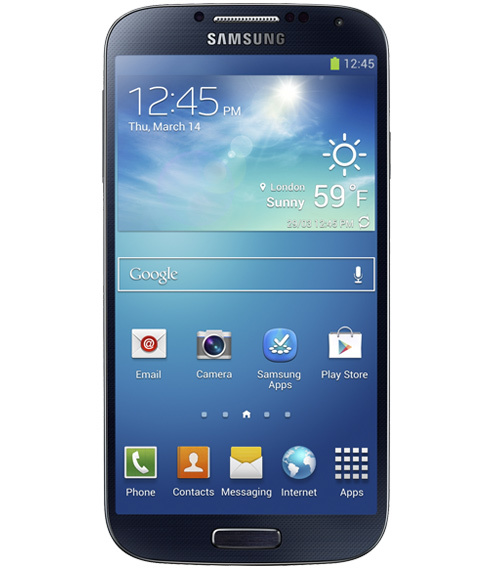 Some of the details can be found in the press release, which states, "Print functionality will be supported with the upcoming release of the Samsung GALAXY S 4 and will be available later this year as a firmware upgrade to the Samsung GALAXY S III and Note II, enabling built-in, wireless printing compatibility." "HP and Samsung Launch New Mobile Print Offering"
When I saw this I wondered, have the companies worked together in the printer arena, where HP is number one and Samsung is number two in laser printers? Or does it have something to do with smartphones and tablets, where Samsung is the leader in Android-based mobile devices, and HP has just entered that market with their offering, after a disastrous effort based around their own operating system, WebOS. Actually, the real story is that HP and Samsung have worked together to have a better printing experience from Samsung's leading mobile devices and HP's leading printers. I am assuming they'll continue to battle each other in the respective categories, as well." What a difference (or not) seven years makes! 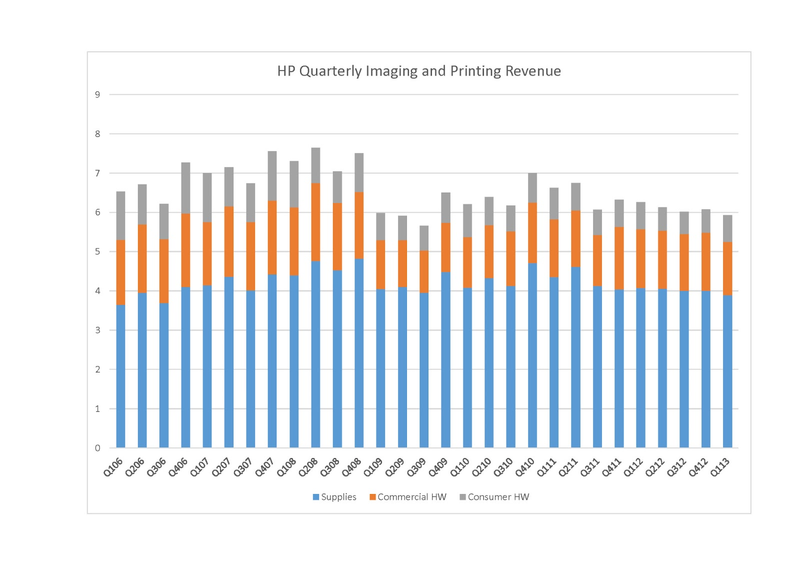 The other day, after catching up with filling in my "HP Printer Metrics" spreadsheet (and announced it with a blog post), I started thinking about differences and similarities in the printing and imaging industry over the last seven years, and wondering if there would be any evidence of changed industry dynamics over those years, just from a look at the high-level metrics, and from the industry leader who despite all the moving parts "underneath the hood" puts in a remarkably consistent financial performance, year-in and year-out. The first quarterly set of figures I included in the spreadsheet was from Quarter One, 2006, and now with the 2013 version in the books (remember HPQ starts their Fiscal Year on November 1st), I took a quick look at the numbers, side-by-side. Quarterly revenues in the seven years fell by about 10%, to just below $6 Billion. And 2013's Q1 showing at $5.9 Billion was the first sub-$6 Billion result since since the $5.7 Billion posted in Q3 of 2009, which was the second sub-$6 Billion quarter in a row, with Q2 2009 matching the most recent quarter at $5.9 Billion. And of the 29 periods in my spreadsheet, Q2 and Q3 of 2009, and Q1 of 2013, are the only three quarters NOT above the $6 Billion benchmark. So with all the optimism after HP's last quarter, one would have to say the business formerly managed under the "IPG" banner is not all that healthy, just looking at the revenues. Profits actually were also less in Q12013 than those reported in Q12006, but by a very small margin, and less, percentage-wise, than the revenue difference. Unlike revenues, there is not a dramatic "threshold" like the $6 Billion which is so rarely not exceeded, though the $1 Billion mark in profits is a median tide line which seems to divide good and bad quarters. And of course, that there is a strong correlation between overall profits and supplies revenues (r=.66) is not surprising. Back to looking at revenues, and the three components reported on by the company, which are supplies, commercial hardware, and consumer hardware, a divergent picture unfolds when looking at the "six years later" quarterly revenue. The supplies business is steadiest, and actually shows growth of nearly 7%, which being in nominal dollars, would probably not represent "real" growth. Commercial hardware declined by nearly 20%, and the consumer hardware quarter-to-quarter comparison shows a whopping 44% decline. A few factors come to mind in explaining these trends - supplies revenue growing, with a (theoretically) continually growing installed base which remains thirsty for its related ink and toner supplies, even with gradually declining average per-unit pricing; commercial hardware slipping gradually, based on eroding demand in office printing, but having stemmed the tide of overall decline with an upward expansion into graphics arts; and general and increasing decline on the consumer side of the hardware business. Speaking of consistency, one last look at this macro-level data really tells a story. When plotting the quarterly revenue "growth rate" on a year-to-year basis, I was stunned to see only four "phases" of positive and negative compares. Beginning in 2006, prior to the "Great Recession", things were in the black, followed by a period of sharp declines which were economically based, with a recovery period lasting six quarterly, and declines over the quarters since. Most of the changes are of the "single-digit" variety, with the exception of the 2008/2009 period, but clearly something has changed. One could argue that the cyclical, economy-based decline was actually less worrisome than the flatter, current period, perhaps driven less by factors like business levels and employment, and more by behavioral and cultural shifts away from printing and hard copy, during what has become what may be called the "mobile revolution" as we look back. While my last few posts involved the HP Analyst Summit in Boston last week (and there will be more to follow), this one represents a bit of housekeeping. 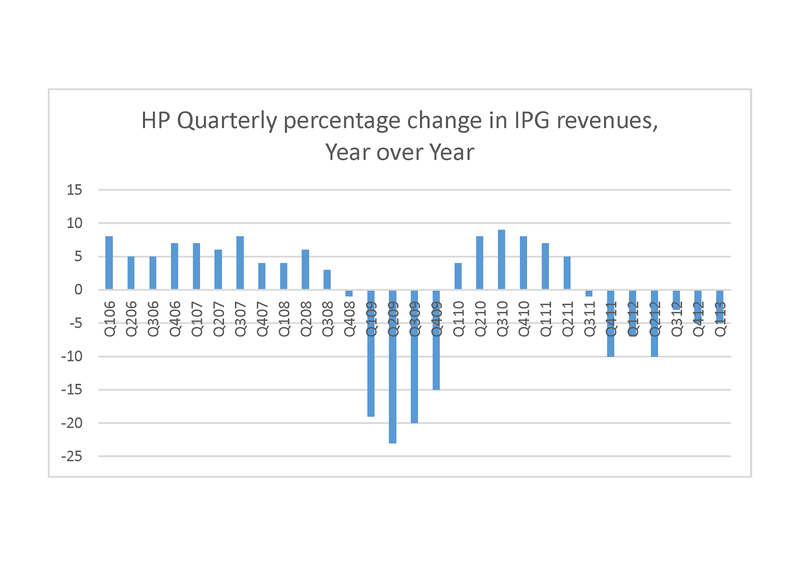 HP's Q1 earnings were announced in late February, and I had been woefully behind in updating my Google docs spreadsheet which tracks all of HP's quarterly printing-related metrics since the first quarter of 2006. The "goodies" below product line detail, like color laser printer growth, all-in-one trends, and Indigo pages printed are long gone, but the higher level figures tell a story too. 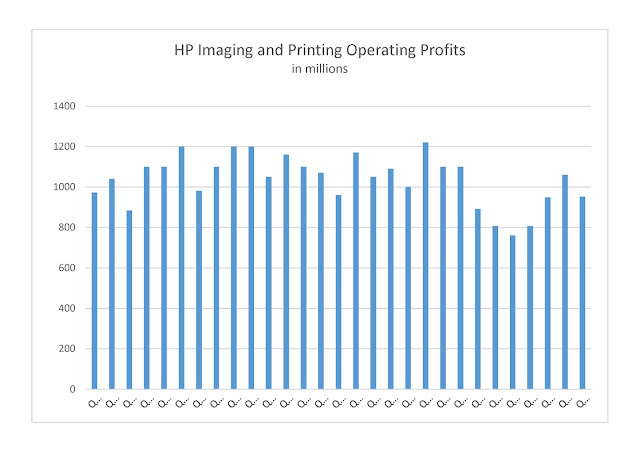 And while the mood at the summit was upbeat for printing and imaging, overall, the end-of-January quarterly numbers were some of the worst ever - hitting bottom perhaps? For example, revenues under $6 Billion was the first time below that water line since 2009. More color to come, but here is my spreadsheet for your perusal. I returned home this evening from Boston, after a full two days of briefings (plus a Tuesday night opening reception). HP put on a great event, and there will be many posts here in the coming days and weeks as I share some of the many significant printing and imaging stories that were covered by the HP management team. In the mean time, here's a link to a Topsy summary of the tweets from #HPSummit over the last several days. Boston, March 6, 2013 - We're well into the HP Analyst Summit I covered here yesterday, with general sessions featuring CEO Meg Whitman and her executive team. We are now getting ready to switch to 1:1's and demos, but a quick recap-so-far seems in order. And since the NDA all analysts signed was fairly specific about not disclosing details during the summit (with the Twitter feed, using #HPSummit, being somewhat of an exception so far), I thought I would offer an anthology-style post with some of my HP printing-and-imaging oriented posts and articles from the last month or so. I hope this will suffice until we are greenlighted on more summit news! HP Doing an Android Tablet - So What Else is New? - What was HP's first Android tablet, and where did it come from? 2013 HP Industry Analyst Summit - Glad to be here! March 5, 2013, Boston -- HP has convened hundreds of industry analysts for a three-day session to disclose news and strategies across the firm's broad swath of technology endeavors. The audience, who collectively cover the many fields of interest where the company does business, will be treated to group sessions led by executives including CEO Meg Whitman, as well as up-close interviews and demonstrations. And I am happy and grateful to be among those attending. Prominent in those fields of interest, of course, is Imaging and Printing, where the company has grown and prospered, bringing much of the larger industry along with it. Many would say that "as goes HP, as goes the industry", so this early-March session has been a highlight of 2013's calendar for some time, and it is very nice to finally be here to take in all the information the company has to offer. I can't wait and stay tuned, here at my blog, as well as my Twitter account, @jflyons, where I expect some good info from other tweeters via the #HPSummit hashtag.